In November of 2002, the Kentucky Transportation Cabinet launched a new traffic information service. You can get up-to-date traffic reports for roads all over the state by calling 511 from almost any phone in Kentucky. Out-of-state callers can call the toll free number 1-866-RD-REPORT (1-866-737-3767) for Kentucky traffic reports. Information is also available online at www.511.ky.gov . 511 Traffic & Travel Info - The Kentucky Transportation Cabinet's central web site for highway and traffic reports from the entire state. Rest Areas - Information about Kentucky's rest areas. Snow and Ice Removal - Maps showing priority snow and ice removal maps for each of Kentucky's counties. Kentucky Roadway Weather Information System - Weather conditions and images from weather stations located at various stations around the commonwealth. Traffic Laws - A brief summary of Kentucky's traffic laws and what to do in case of a traffic emergency. Kentucky Weather Information - Weather information for cities across Kentucky. Active Construction Projects - A text file listing active construction projects in Kentucky. Courier-Journal TrafficCam - Live images from cameras located on highways throughout Louisville. Lexington Traffic Information Network - Information about traffic conditions in Lexington from the urban county government. KyTourism.com - The official tourism website of Kentucky. Contains information about things to see and do in Kentucky. 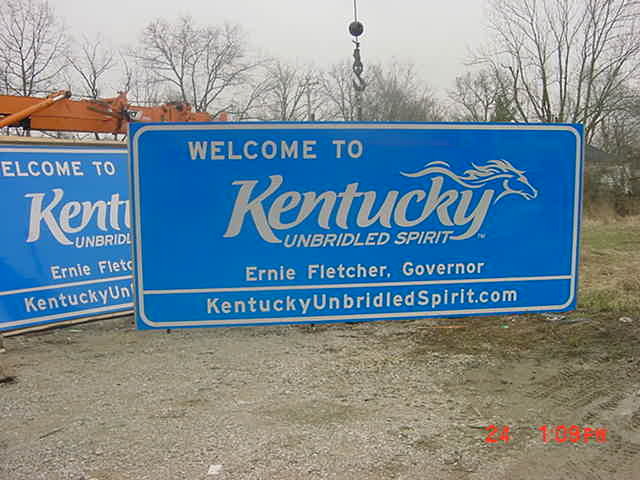 Scenic Highways - Emilebymile provides information about scenic highways and byways in Kentucky. Included background information about the scenic drives and information about some services along drives. Open Directory - Kentucky - Links to websites containing information about Kentucky listed in the Open Directory. Highway 127 Yard Sale - Contains information about the World's Longest Yard Sale held in August of each year along US 127 in Alabama, Tennessee, and Kentucky. Kentucky Transportation Cabinet Division of Planning: Scenic Byways - Administrative information concerning Kentucky's officially desiginated scenic byways. FRANKFORT, Ky. (July 15, 2010) – Governor Steve Beshear’s ongoing effort to make Kentucky roads safer takes a big step beginning today, when a new law takes effect to ban texting for all drivers and cell phone use for drivers under 18. FRANKFORT, Ky. (July 14, 2010) – Governor Steve Beshear’s ongoing effort to make Kentucky roads safer takes a big step on Thursday, July 15, when a new law takes effect to ban texting for all drivers and cell phone use for drivers under 18. FRANKFORT, Ky. – The 2010 Kentucky Official Highway Map is now available across the Commonwealth at rest areas, welcome centers, local convention and tourism offices and all Kentucky State Parks. FRANKFORT, Ky. (May 27, 2010) — Just in time for the vacation travel season the Kentucky Transportation Cabinet has launched an enhanced traffic information website with a number of new features. The new site, at the same Web address of 511.ky.gov , operates on a Google Maps-based system, which will be familiar to many users. BOWLING GREEN, Ky. (April 29, 2010) - Motorists will encounter a new type of traffic signal on Scottsville Road beginning next week. The light includes a flashing yellow arrow, which indicates that motorists are allowed to proceed with caution but must yield to oncoming traffic. The Kentucky Transportation Cabinet (KYTC) has implemented this new signal in six other highway districts with success. It is already being used in Colorado, Florida, Michigan, Minnesota, Nevada and Oregon. LOUISVILLE, Ky. (Oct. 5, 2009) — Work on northbound Interstate 65 will continue a week longer than expected because of the discovery that ground beneath the road surface – an area known as the sub-grade – is unstable and requires extensive repairs. MADISONVILLE, Ky. — Deer are dangerous this time of year: It’s the beginning of mating season — and the nimble creatures are on the move, often putting themselves in the path of motorists. The Kentucky Transportation Cabinet is reminding motorists of the October to January mating season, when deer-related crashes spike. FRANKFORT, Ky. (Oct. 1, 2009) – The number of people killed on Kentucky’s roadways is increasing, according to preliminary numbers from the Kentucky Office of Highway Safety (KOHS). There were 586 fatalities as of Sept. 30, five more than at the same time last year. LOUISVILLE, Ky. (Sept. 16, 2009) — Gov. Steve Beshear, joined by Louisville Mayor Jerry Abramson, today announced the beginning of a major construction project to repair the pavement on Interstate 65 in Jefferson County. The $28.7 million project – “Revive 65” – involves the replacement of concrete pavement with asphalt on the 3-mile section of interstate between Fern Valley Road and I-264 (Watterson Expressway). It is among a dozen road and bridge projects, totaling more than $195 million, under way or planned for the Louisville area. FRANKFORT, Ky.—The Kentucky Transportation Cabinet now offers 511 traffic information through Twitter. This feature provides the latest road closures, delays, construction areas, vehicle crashes and other roadway incidents. ELIZABETHTOWN, Ky. (July 14, 2009) � Work to rehabilitate two sets of twin bridges � over Green River and US 31W � continues along Interstate 65 in Hart County. Northbound I-65 - Traffic will be pushed down to one lane and motorists can expect long delays while work is done on the northbound bridge over US 31W at mile marker 64. This work will continue around the clock until Thursday, July 16. Southbound I-65 - Traffic will be pushed down to one lane and motorists can expect long delays while work is done on the southbound bridge over the Green River at mile marker 61. This work will continue around the clock until Friday, July 24. There will be a signed detour following US 31W for wide loads during the construction work. Motorists are asked to use extra caution and may wish to seek alternate routes during this time (US 31W/US 31E). Travelers can log on to the 511 system at www.511.ky.gov . for additional information about roadway conditions. ELIZABETHTOWN, Ky. (July 1, 2009) � Work to rehabilitate two sets of twin bridges � over Green River and US 31W � continues along Interstate 65 in Hart County. Wednesday, July 1: Traffic will be pushed down to one lane and motorists can expect long delays while work is done on the southbound bridge over US 31W at mile marker 64. Thursday, July 2: Work will continue on the southbound bridge over US 31W until 10:00 am. Work will restart on Saturday, July 11th for the northbound bridge over the Green River at mile marker 61 at 4:00 pm. Motorists are asked to use extra caution and reduce their speed in the area. BOWLING GREEN, Ky. � Beginning tomorrow morning at 6:00 a.m., KY 3225 (Old Louisville Road) will have a lane closure from the north side of the bridge to Ben's Bait and Tackle Shop while workers install curb, gutter and sidewalk. This lane closure will only be in place from 6:00 a.m. until 5:00 p.m. from April 2 until Friday, April 10. JACKSON, Ky. � KY 1833 in Perry County is closed due to a rockslide. This closure will remain in effect until repairs are completed. An estimated time and date for completion of the removal of the slide is not yet known. The location of the rockslide is near the entrance to Buckhorn Lake State Resort Park. Access to the park�s lodge will be impacted until the rockslide is removed. The state is still cleaning up from recent ice and wind storms. This morning at 7:35am the Kentucky Transportation Cabinet District 3 office in Bowling Green reported that I-65 northbound was completely blocked mile marker 19.5 due to an accident involving a tractor trailer. Motorists traveling on I-65 northbound should consider alternate routes. Exit 6 is the last exit from I-65 before the accident site. Work began this week to rehabilitate the south bound lanes of the William H. Natcher Parkway in Daviess County. Work will continue through September 2006. Travelers should expect to encounter lane closures. H.B. Elkins will be hosting the Eastern Kentucky-Central Appalachia Road Enthusiast Meeting this coming Saturday, May 21 at noon EDT at Reno’s Roadhouse in Pikeville, Kentucky. Afterwards there will be an informal tour of the US 119 reconstruction project in Northern Pike County. If you are interesting in attending, please RSVP to H.B. Elkins at kyroadgeekreply@yahoo.com . Transportation Cabinet official Tim Henderlight set up a desk in a highway work zone in Breathitt County Friday to make his point as he discussed the need for driving safely in construction zones. Henderlight held a news conference to discuss work zone safety in Eastern Kentucky at the site of a $37 million construction project to relocate KY 15 and widen it to four lanes. Photo by H.B. Elkins, District 10 PIO. Frankfort, KY (May 2, 2005)�The Kentucky Transportation Cabinet (KYTC) has successfully completed 80% of the LED signal upgrades throughout the Commonwealth. The remaining upgrades are expected to be complete by early summer and result in projected savings of more than $3.2 million a year to taxpayers as well as improved safety at intersections. According to a press release from Gov. Fletcher’s communications office, new welcome signs such as these are being installed near the state’s entries points. Eleven large signs will be installed along the state’s interstates and approximately 60 smaller signs will be installed along secondary roads. The large signs cost $40,000 to produce. Photograph courtesy Kentucky Transportation Cabinet. The southbound lanes of I-75 in Tennessee between exits 160 and 134 are expected to remain closed until Friday, March 11. Weather has delayed the completion of cross over lanes that will allow southbound traffic to bypass a collapsed section of southbound lanes. The Kentucky Transportation Cabinet’s “Patch It” hotline is up and running at 1-800-PATCH-IT (1-800-728-2448). Motorists can use this number to report pot holes or other problems on any state maintained highway. Callers to the hotline should be ready to describe the pothole’s location, including the number of the highway and either a mile marker or landmark near the location of the pothole. Formerly, the hotline was only available during the pothole season—February 1 to May 1; however, the cabinet will now operate the line year round. With daytimes beginning to break through the freezing point, refreezing continues to pose a threat to drivers on Kentucky’s highways. Pools of water from melting snow and ice may pool on streets and highways during the day and then refreeze when the temperate drops overnight. Drivers should be weary of black ice—stretches of highways that appear to be damp but in fact are covered by ice. Up-to-date highway conditions can be found at: www.511.ky.gov . The Kentucky Transportation Cabinet began preparing for winter weather long before today’s winter storm. The cabinet’s Division of Highway has established a three tiered system for removing snow and ice from the state’s highways. Priority A routes—which include the state’s interstates, parkways, and major corridors—will be cleared first. After the Priority A routes are all cleared, work will move to the Priority B routes—important secondary routes. And finally all remaining state roads—Priority C routes—will be cleared. The transportation cabinet has produced maps showing the snow and ice removal priority of state highways . Up-to-date travel information for the state’s highways can be found at www.511.ky.gov . You can also dial 511 from any cell phone to obtain road condition information. It is up to local municipalities to remove snow from city and county streets and roads. The Kentucky Transportation Cabinet has begun installing signs reminding motorists of the state’s “move over” law. Motorists should slow down and use caution when approaching stopped emergency vehicles with flashing lights. On four lane roads, motorists should move to the lane furthest away from the stopped emergency vehicle. The October 2004 and the 2004 Year-in-Review editions of the transportation cabinet’s newsletter have been posted to the KYTC Konnection page . The SAFE program that aids broken down motorists. Information about a KYTC employee’s trip to Russia to participate in an engineering exchange program. Coverage of the installation of new “Move Over or Slow Down for Stopped Emergency Vehicle” signs. Coverage of ceremonial beginning of the Kennedy Bridge repainting project. A story about KYTC employees rescuing a cat from an Ohio River bridge. Information about the opening of a reconstructed segment of US 421 in Harlan County. Information and photographs of work on I-66 in Pulaski County. The Kentucky Transportation Cabinet reminds holiday party goers: If "You Drink & Drive. You Lose." In October the Kentucky Transportation Cabinet began testing the Safety Assistance for Freeway Emergencies (SAFE) program in I-75 in Laurel County and I-64 in Franklin County and Shelby County. The SAFE program operates cargo vans over the highways and helps motorists with highway emergencies ranging from flat tires to running out of gas. When a SAFE driver aids a motorist, the motorist is given a comment card to return via mail; the comments so far have been overwhelmingly positive. Kentucky’s statewide highway information line which can be reached by calling 511 from anywhere in the state has received its millionth call. The service began in November 2003 and currently receives an average of 80,000 calls per month. County and state officials are working together to determine where to place guide signs to direct visitors to Pike County attractions. The large brown signs will be installed along streets and highways throughout the county. The online version of the 2004 Official Highway Map has been released: Kentucky Transportation Cabinet: Official Highway Map . The Kentucky Transportation Cabinet released the 2003 version of the official highway map on May 29. There were no apparent major changes over the previous year's, except for the fact that on June 10, the map was modified to show the former Daniel Boone Parkway as the Hal Rogers Parkway. The map is now available in rest areas. I picked up a copy at the Paducah Welcome Center yesterday. The cover art is a photograph of the William H. Natcher Bridge. The United States Congress is considering eliminating the 47-year-old ban on the commercialization of rest areas. The Bowling Green Daily News examines what the affect of lifting the ban could be. An advertisement promoting Northern Kentucky's covered bridges apparently shows a New Hampshire covered bridge. The Bowling Green Daily News reports in this March 14, 2003 article that Kentucky Transportation Cabinet has setup a pothole reporting hotline. The hotline can be reached at 1-800-PATCH-IT (1-800-728-2448). If the reported pothole is on a state-maintained road, the automated system reports it to the appropriate highway district. The City of Bowling Green also has its own pothole report phone number. The Courier-Journal reports in this March 23, 2003 article that Louisville Metro expected to spend $500,000 on repairing potholes. The Kentucky Transportation Cabinet launched a new telephone and online travel information system on November 27, 2002. By dialing 511 from most telephones in the commonwealth, travelers can receive up-to-date information about driving conditions on Kentucky's highways. The information is also available online at www.511.ky.gov . The Bowling Green Daily News reports in this article that three rest areas on I-65 will be closed: two in Warren County and a third in Hart County. The rest areas are being demolished because they are unable to handle current traffic on I-65. The stretch of road handles between 35,000 and 45,000 vehicles per day. Around 50% of this traffic is truck traffic, and the rest areas do not have adequate parking for trucks. Update Feb. 10: This Glasgow Daily Times article discusses the rest area work as well.